Kensington – SV Global Innovations LP (“KSV”) leads Series C funding round with Savano Capital Partners, Salesforce Ventures, Cross Creek Advisors, EPIC Ventures, and University Growth Fund, providing strategic capital to Simplus for organic and acquisition-based growth. 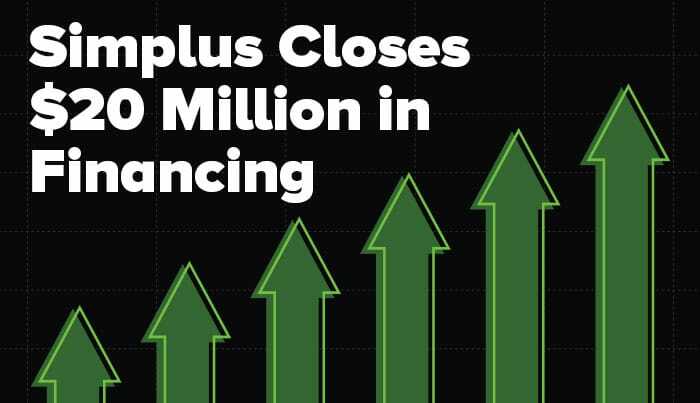 SALT LAKE CITY—Jan 29, 2019—Simplus, a leader in Salesforce Quote-to-Cash, has successfully closed $20 million to further increase capacity across its product and service offerings, as well as acquire companies with complementary solutions valuable to customers. Silicon Valley Bank will provide an additional $6.5M in debt financing. The round, designed to further ongoing expansion, was led by Kensington – SV Global Innovations LP (“KSV”) and joined by Savano Capital Partners. Existing investors Salesforce Ventures, Cross Creek Advisors, EPIC Ventures, University Growth Fund, Simplus CFO Paul Fletcher, and G2 Crowd CEO Godard Abel, also participated in the round. KSV was drawn to Simplus because of its strong management team and performance along with its unique combination of high customer satisfaction and award-winning culture. Simplus chose KSV to lead the Series C funding round because of its expertise in global markets, merger and acquisition transactions, and high-quality partnerships with companies in growth-stage businesses. Simplus and KSV will focus its partnership on bringing Simplus’ expertise as the leader in Salesforce quote-to-cash to the global community and expanding its offerings to include products and services that enhance the quote-to-cash process. Simplus is currently one of the largest CPQ (configure, price, quote) global technology service providers, with more than 150 certified consultants and offices in the United States, Canada, Australia, and the Philippines. Simplus has emerged as a strong leader in Salesforce quote-to-cash innovation, introducing intellectual property such as the first CPQ-focused manufacturing accelerator for Salesforce in Fall 2018. Simplus was ranked as the #1 fastest growing consulting firm in 2018 by Consulting Magazine and a “leader” among 285 Salesforce consulting providers on the G2 Crowd Grid. Simplus provides enterprise-wide digital transformation across the entire Salesforce ecosystem through advisory, implementation, change management, custom configuration and managed services. As a Platinum Salesforce Partner, we use leading cloud solutions to help companies achieve a strategic vision, improve performance and increase value to stakeholders. With more than 2,000 projects and a customer satisfaction rating in the top 1 percent of all Salesforce partners, Simplus helps companies improve, innovate and grow. For more information about Simplus, please visit www.simplus.com. Salesforce Ventures is the fastest growing top five enterprise software company and the #1 CRM provider globally. Salesforce Ventures—the company’s corporate investment group—invests in the next generation of enterprise technology that extends the power of the Salesforce Customer Success Platform, helping companies connect with their customers in entirely new ways. Portfolio companies receive funding as well as access to the world’s largest cloud ecosystem and the guidance of Salesforce’s innovators and executives. With Salesforce Ventures, portfolio companies can also leverage Salesforce’s expertise in corporate philanthropy by joining Pledge 1% to make giving back part of their business model. Salesforce Ventures has invested in more than 280 enterprise cloud startups in 18 different countries since 2009. For more information, please visit www.salesforce.com/ventures.